A decorative arch connects the living to the dining room with its wainscoting, built-in buffet, window seat, and refinished oak floors. The covered porch is well-lit and is protected from weather by windows on two sides and opens into the front entry hall. If you’ve been dreaming of a sweet and bright spot to settle down, something from the days of hardwood floors and covered porches, with vintage charm - maybe built-ins and a windowseat - a place to grow a garden, room to bloom and room to play, then read on. This one’s for you. This Craftsman home with refinished oak and fir floors, fresh paint inside and out, updates in the kitchen, and a fully-fenced back yard, is in walking distance of the international cuisine and local shops of the Lincoln District, but it’s also just a 5 minute drive to Tacoma’s downtown. We have a whole section on location and neighborhood further down! Continue on for the video tour, photos, neighborhood highlights (including driving and walking distance/time to a list of Tacoma favorites), and many more details about this home. 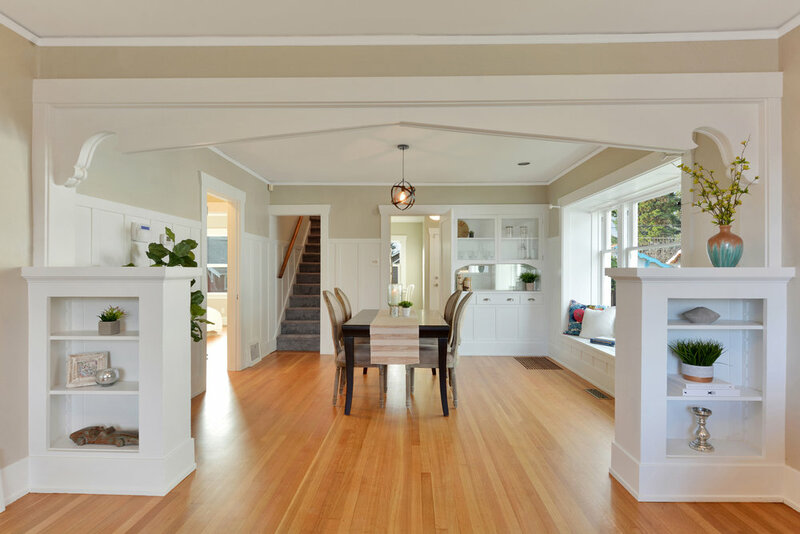 A glimpse of the living and dining rooms with their refinished hardwoods, built-ins, and Craftsman details. Flexible upstairs living space. Office? Homework spot? Yoga and reading nook? 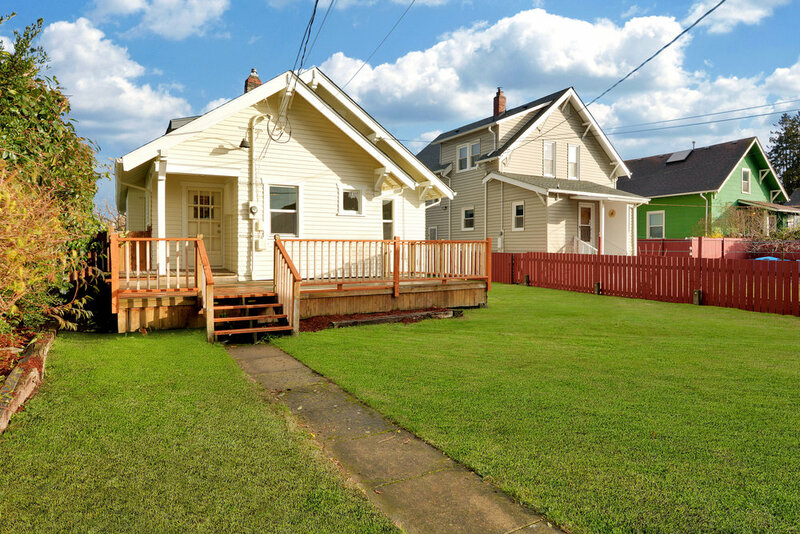 The fully-fenced back yard is big with a wooden deck right off the kitchen! Refinished oak floors extend through the living room with its big windows, built-in shelves, and crown molding. 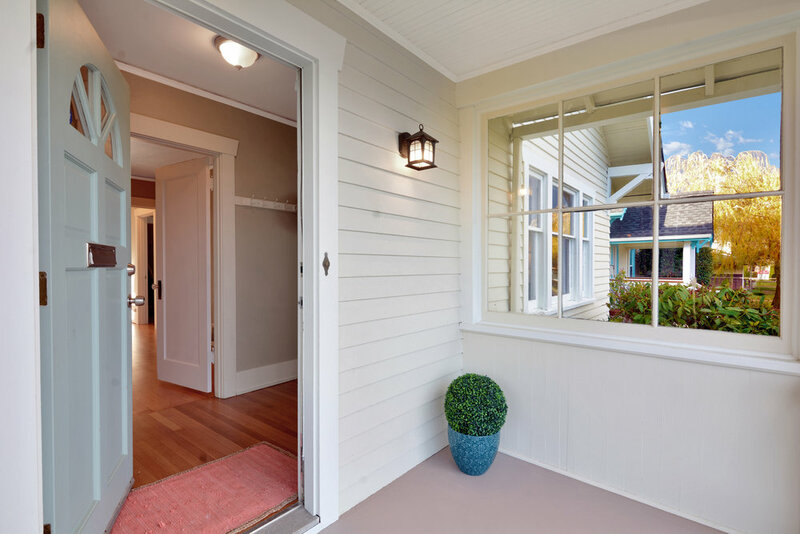 Before even entering the house the fresh paint and covered front porch with its side windows to keep out the rain and wind give a sense of the comfort and practicality to come. Step inside and pause in the entry hall where you can hang up your bag and jacket, maybe slip off your shoes, and get ready to get cozy in the bright living room. Since the whole interior and exterior of the house are freshly painted, this room and all the others are ready for the art and family photos you might like to hang. With refinished oak floors, big windows, crown molding, and wide trim, the living room is picturesque. Add some favorite objects, books, photos, or flowers to the built-ins under the decoratively trimmed arch into the dining room and you have a room that is as inviting and pretty as it is comfortable. Now step under that arch to see the dining room. The living room features large windows facing north and east that easily open for fresh air. The dining room with its white wainscot, fresh paint, and beautiful oak floor as seen from the kitchen. The refinished oak floors and Craftsman details continue in the spacious dining room. A built-in buffet with drawers and glass front cupboards is a good spot to keep your nice flatware on hand. Or, maybe these are odds-and-end drawers where spare notepads, receipts, pencils, mismatched coasters, a ruler, some rubber bands, and hair clips end up. We don’t all live at Martha Stewart’s house! But the point is, if you want to, this pretty hutch is ready to help you entertain. Heirlooms and favorite dishes can go on display in the cupboard above. This bright dining room with its charming window seat and wainscot is a beautiful place to host a dinner, but its not too grand or fussy for everyday dinners. It’s a room to use everyday, for simple meals and festive feasts alike. Leave the door to the kitchen wide open, or close it if you need to shut out distractions or just hide a mess! The dining room is a hub in this house. It opens into the main hall where bedrooms and bathroom are found, offers access to the kitchen, and is also where the stairs to the upper floor begin. This spacious dining room opens into the main floor hallway on the left, the stairwell to the upper floor, and opens into the kitchen (or the door may be closed if desired). The eat-in kitchen features new countertops and new stainless undermount sink to match the full set of stainless appliances. The kitchen is complete with a breakfast nook overlooking the back yard. Speaking of the kitchen, it’s located right off the dining room at the back of the house with a view to the big back yard, and a door straight onto the deck. A brand new stainless undermount sink and brand new counters along with fresh paint (found throughout the house) bring out the cozy charm of this kitchen with its breakfast nook in the corner. Stainless appliances (stove, refrigerator, and dishwasher), a good set of white cabinets for dishes and pantry items, plenty of drawers, and multiple windows make this little kitchen a nice spot to cook, eat breakfast, or sit for a cup of tea. Freshly painted cabinets with new hardware maintain a classic style. The back door opens onto a deck in the fully fenced back yard. A final look at the kitchen with the dishwasher on the left and the stove and refrigerator shown to the right along with more cabinets for dishes, cookware, and pantry items. One of two main floor bedrooms with refinished fir floors. This room, at the back of the house, offers a walk in closet, crown molding, and windows facing south and west. Another view of this bright main floor bedroom at the back of house with a view down the hall into the second main floor bedroom. The second main floor bedroom with a door opening into the front hall and the closet shown on the right. The two main floor bedrooms and the hallway they share with the full bathroom are floored with beautifully refinished fir. This colorful wood pairs well with the white trim and earthy neutral walls creating a classic palette. The front bedroom is accessible either through the entry hall, or the main hall off the dining room. A south facing window to the side yard, crown molding, and closet finish the room. The back bedroom also features crown molding and the warm tones of those fir floors. This room has two windows, one south facing, and one looking west over the back yard, as well as a walk-in closet with a little window of its own. 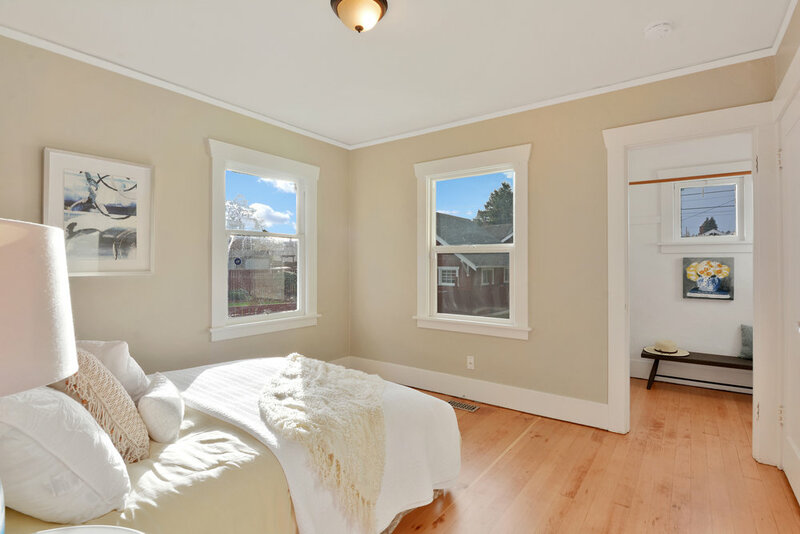 This second main floor bedroom with refinished fir floors, crown molding, and south facing windows is located near the front of the house. 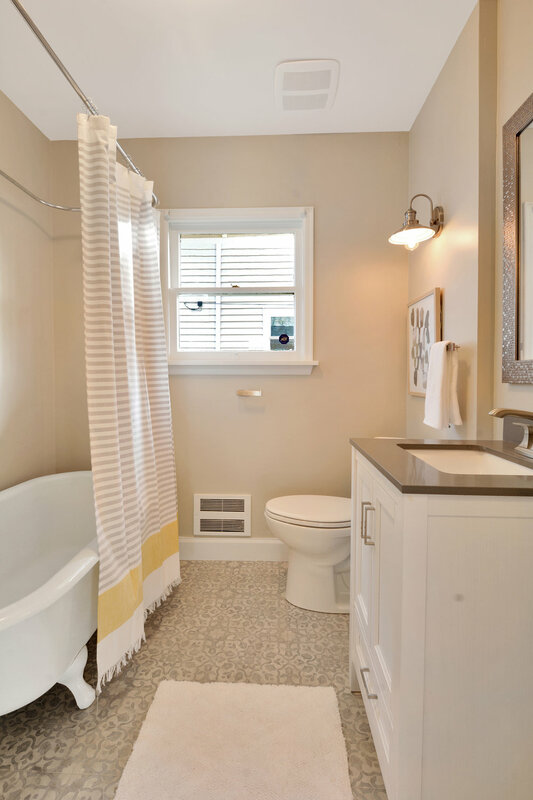 The full bath, located between the two main floor bedrooms, features a claw foot tub, brand new vinyl floor, and a vanity with undermount sink and cupboard below. A linen closet just outside the door offers additional storage. Between the two main floor bedrooms sits the full bathroom with a claw foot tub. The vinyl flooring is brand new. An undermount sink in the vanity makes for easy cleaning with cupboard below for storage. A fan and window help with air flow. This is a simple room, clean and practical, with attractive attributes such as the set of sconces, the large mirror, and the overall vintage feel. With warm neutral tones in the patterned floor and freshly painted walls, there’s room for fun with the shower curtain and towels. In the hallway just outside the bathroom door, a linen closet with a set of 3 drawers offers a convenient spot for bath towels and other supplies. At the top of the stairs brand new carpet covers this additional living space with its set of north facing windows. 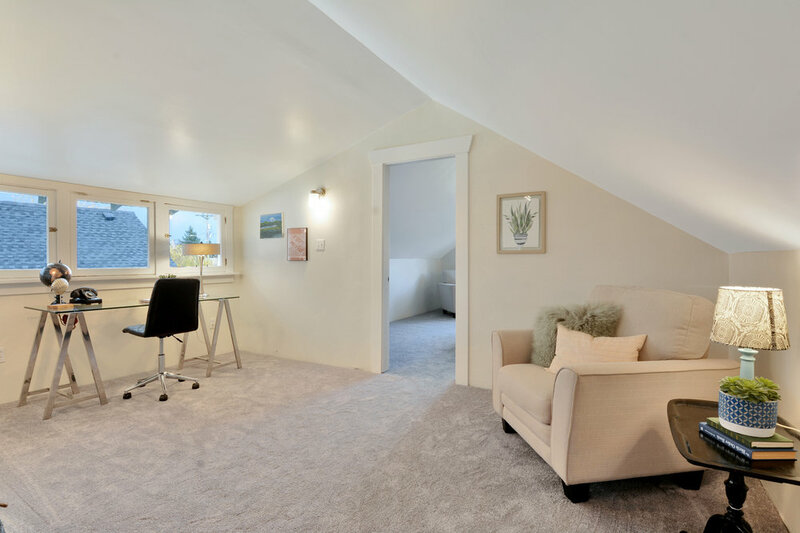 Use this upstairs space for reading, yoga, homework, office, or playroom. Take the stairs up from the dining room and find yourself in an additional living space. This room could be where you roll out a yoga mat, or a quite corner where you sit and read. Set up an office, a drawing space, or a spot for homework where the set of 3 windows looks north. It can take some time to know how you’d like to use it, but this flexible kind of space can make all the difference in a home. A door from this extended landing on the upper floor leads into a third bedroom. With sloped ceilings and the new gray carpet found throughout the second floor, this is a comfortable room with a pair of windows facing east toward the sunrise. This third bedroom, located upstairs, is cozy with brand new carpet, sloped ceilings, and windows facing east for the sunrise. A door from the kitchen leads down to the unfinished basement. Take a right at the bottom of the stairs into the laundry area with a double utility sink, countertop, and cupboard. There’s a lot of open space down here that can be used for storage. Add some shelving, create a workshop, or even consider finishing some of this space. The unfinished basement offers plenty of space for storage, or set up a workshop. The gas furnace and gas water heater are located down here. Basement laundry area with double utility sink, countertop, cupboard, and some shelving. The fully-fenced back yard is big! There's room for flower beds, a vegetable garden, swings set, room for pets, and room to play. This freshly painted Craftsman home faces east onto South D street with a front lawn gently sloping up toward the covered front porch. We’ve already visited the covered front porch, but don’t forget there’s a whole front yard out there. From the sidewalk, it’s just 3 steps up to the paved path leading to the porch. The front and back yards are lawn right now, and there’s plenty of it! Depending on your style and enthusiasm, you can keep a wide open green lawn space, or add trees, shrubs, flower beds, a swing set, play house, and a vegetable garden. The back yard is fully fenced and there’s a deck for barbecuing and setting up patio furniture. The single car detached garage is located in back as well with access from the alley or the yard. This yard offers so much space and possibility! Garden and grow. A wooden deck right outside the kitchen door offers a great place to barbecue and set up the patio furniture. A single car garage borders the alley in the fully-fenced back yard. Bob Henry’s Leaping Salmon Mural on the corner of S 38th & Yakima with Vien Dong in the background. The Stadium Bowl, built in 1940 with Stadium High in the background. Stanley & Seafort’s and its famous downtown view - image from Stanley & Seafort’s . This home belongs to a distinctive and vibrant South End neighborhood called the Lincoln District. We love this part of Tacoma! Here you’ll find the beautiful brick gothic style Lincoln High School (Tacoma’s 2nd oldest high school, home to the Lincoln Bowl and the annual Lincoln Plant Sale) with Lincoln Park adjacent. Just down the block from the school there’s a post office and the real-deal, old school, locally owned and operated Lincoln Hardware where the staff are always willing to help. Is this starting to sound like a small town from decades ago? Well, don’t get stuck there. Go around the corner onto S 38th St and you can eat tortas at El Zocalo, get a steaming bowl of pho, a burger and milkshake, or shop for rice noodles, dried fish, mushrooms, and that staple bottle of sriracha at the Hong Kong Market. The Lincoln District is by turns old-timey and international, quaint and gritty, historic and up-and-coming. Having just gone through a revitalization, you’ll find improved sidewalks, crosswalks, and public art. Tacos at El Zocalo Tortas & Bakery just 1/2 a mile away! Image from El Zocalo. This home also enjoys easy access to the famous view at Stanley & Seafort’s, or over to the Tacoma Mall, Costco, and REI in the other direction. The restaurants, museums, and bustle of downtown are a 5 minute drive away, and access to I-5 is close and convenient. If you commute by bus, or just like hopping on for a Seattle day trip, the Tacoma Dome Station is just over a mile away. Take a look at our list of favorite Tacoma destinations below. We’ve calculated the distance from the doorstep of this Tacoma Craftsman, as well as the time it takes to drive or walk to these practical and popular spots. 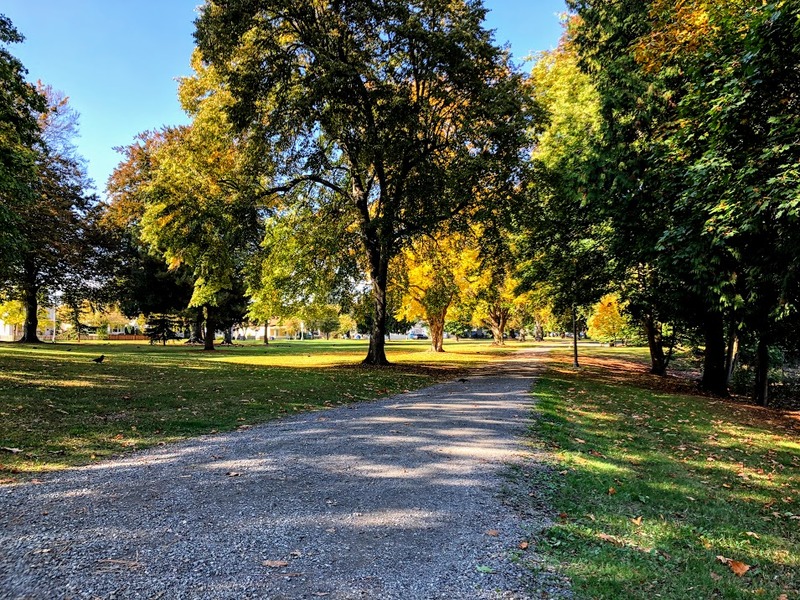 A shaded path through Lincoln Park toward the covered picnic area and playground. Pho less than a mile away! Image from Vien Dong. The long and short of it is, this house is in a great spot! Open House: come see it in person on Saturday, December 1st, 10 am - 3 pm and Sunday, December 2nd, 11 am - 1 pm.